Fìlosofìâ osvìti. 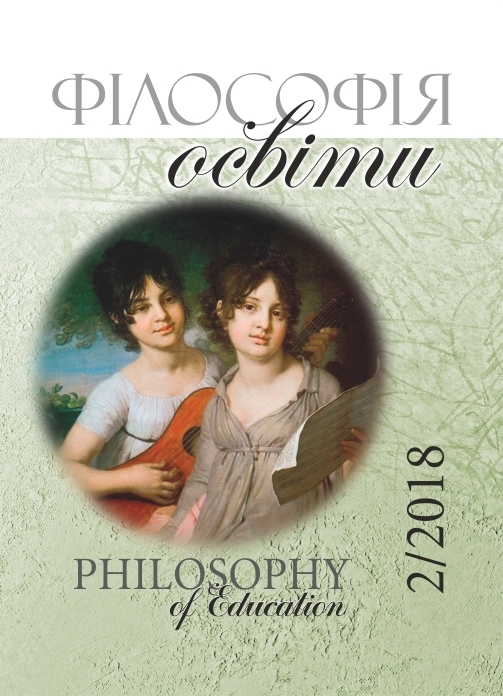 Philosophy of Education (ISSN 2309-1606 (print), ISSN 2616-7662 (online) ) is a scientific journal published by the Institute of Higher Education of the National Academy of Educational Sciences of Ukraine in cooperation with Ukrainian Society of Philosophy of Education. It is a peer-reviewed journal with open access, which focuses on theoretical, methodological and praxeological problems of the philosophy of education. It publishes articles presenting a wide range of philosophical and educational issues, in particular, the problems of the transformation of education in the context of globalization, the information and communication revolution in the context of a transit society, which is Ukraine. The journal forms the space of philosophical discourse, deduces modern research into understanding the strategies of reforming education in the 21 st century from the standpoint of different methodologies and philosophical approaches. The journal published translations of the works of well-known philosophers (M. Horkheimer, T. Adorno, J. Habermas, P. Sloterdijk) and original articles, interviews by well-known contemporary philosophers, sociologists and educators, such as William McBride, Peter McLaren, Edgar Morin, Ervin Laszlo, Piotr Sztompka, Jenifer Gore, Jan de Groof, Michael Peters, Francis Fukuyama, Michael Burawoy, Jin-Whan Park, Ken Roberts, Andrew Feenberg. The journal is the center of professional consolidation of the Ukrainian community of education researchers and also develops contacts with academic communities from other countries. The editorial board is presented by researchers from Ukraine, USA, Poland, Greece, Croatia, Sweden, Moldova, and Russia. Its activity includes not only the publication of the journal but also the holding of scientific conferences, methodological seminars, roundtables on topical issues of education, popularization, and implementation of research ideas and developments in educational practice. Founded in 2005. Published twice a year.